There are some fabric scraps that I just cannot get rid of, no matter how small the pieces. They are just too darn precious. Maybe they were bought on a memorable trip or were an expensive splurge (Liberty of London fabric anyone?) or they are just a favorite because they are just so lovely. Whatever the reason, I hang onto fabric scraps…lots of them! I came up with this easy DIY to both highlight my scrumptious fabric scraps and jazz up our family’s organizational board. Can all of that be done in one quick and easy DIY? Oh yes it can! 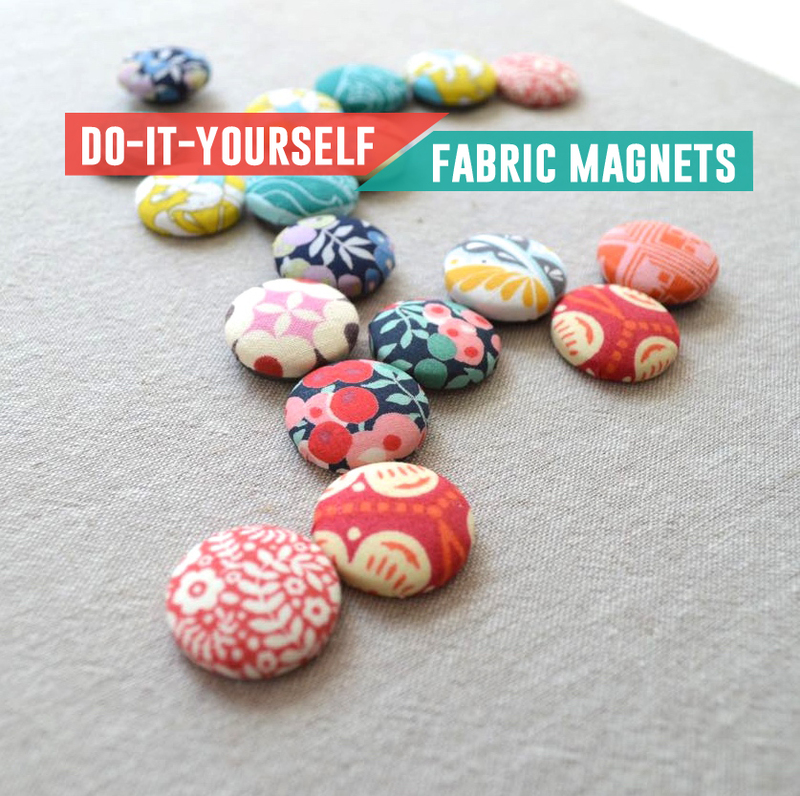 Fabric scrap magnets are here to save (and prettify!) the day. With our supplies on hand, we can get started! 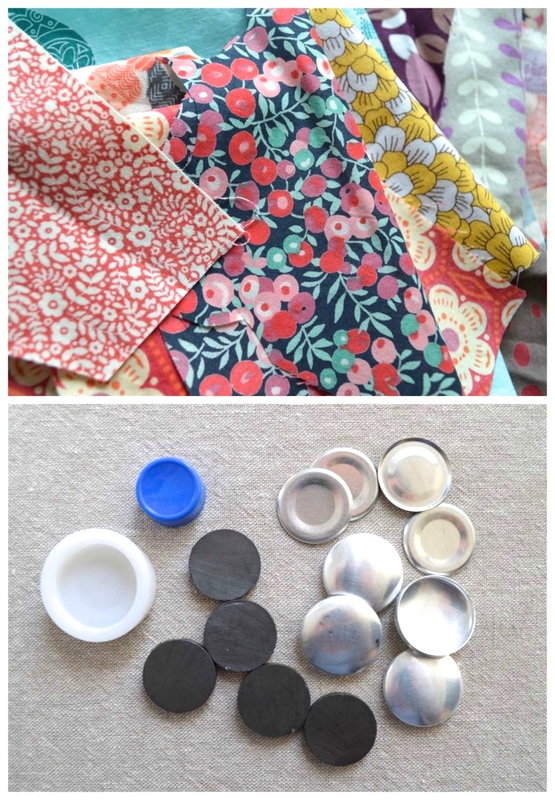 We will be essentially making a fabric button in the conventional method, the main difference is you will attach a plain back and glue on a magnet. See? So easy! 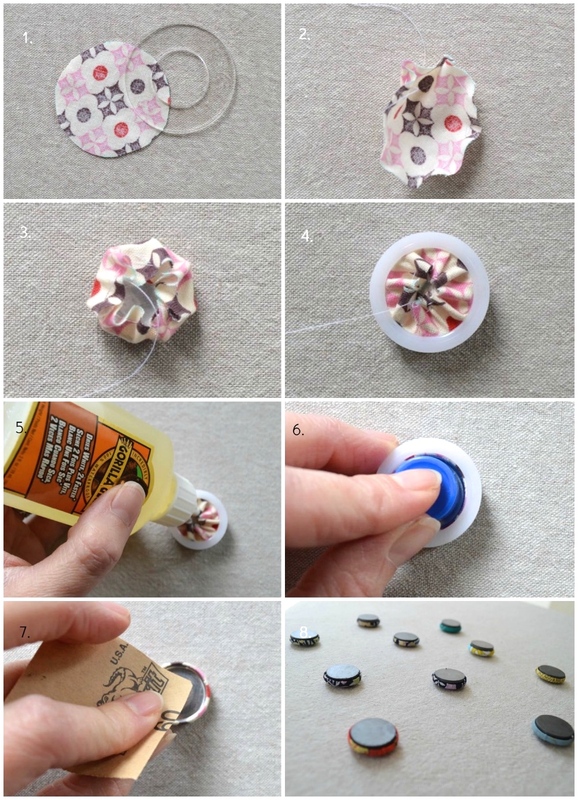 Cut your fabric scrap to the correct size using the plastic ring included in your kit. Draw with your marking pen a circle (note: whatever is visible in the inner circle is what will be visible on your magnet) and cut out the circle you have drawn. Loosely thread around the entire perimeter of your fabric circle and pull on it just a little such that the right side of the fabric is rounded outward. Place a single button shell in the middle of the fabric circle with the convex portion of the button facing the wrong side of the fabric. Pull the thread until it is tight. Place the tightened button inside of the white button mold in your kit. This will completely smooth the fabric over the metal button piece. Pull the thread even tighter and cut it off. Drop a small bit of of Gorilla Glue in the middle on the metal button piece. This will help the button back stick. Take one of the plain backs (without a shank) and press it in place using the blue pusher tool. Rub the plain back just a little with your sandpaper, this will help ensure the magnet stays stuck to your button and doesn’t come unglued the minute it is used on a magnetic board. Apply a thin layer of Gorilla Glue to the button back and place stick on your magnet. Gorilla glue expands as it dries so be sure to avoid putting too much glue down. Let it dry. Now go make a whole bunch! Aren’t these just about the best magnets you have ever seen!? Obviously you could play around with different sized buttons and magnets and make some really tiny or really big, bold magnets. They have been super popular around our house. 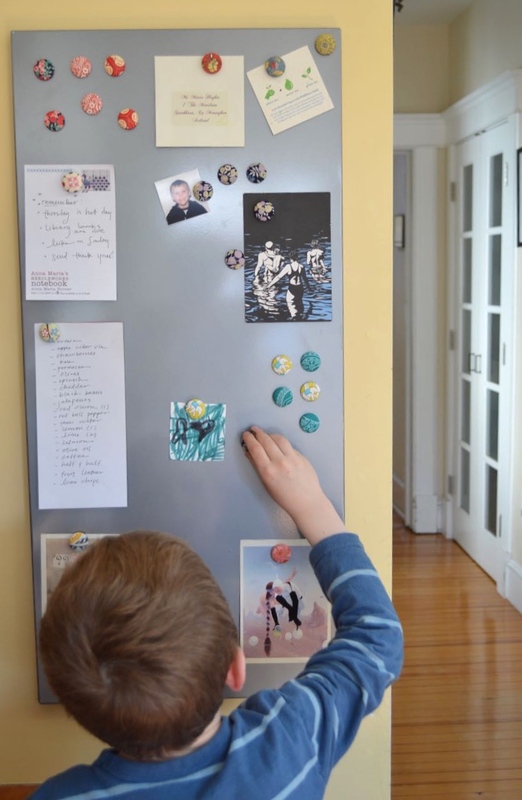 Lots of fun to move around the magnet board for (ahem) all family members! These would also make a great housewarming gifts, pair a handful that look good together and warm up a new house. Who doesn’t love a beautiful magnet set? Nobody, that’s who! Happy scrapping! Thanks Veronica! I had so much fun making them! Wow that’s fantastic. I have a site that is dedicated to craft all kind of stuff (loom bands mostly) and I’ll love to put some of your stuff in there. 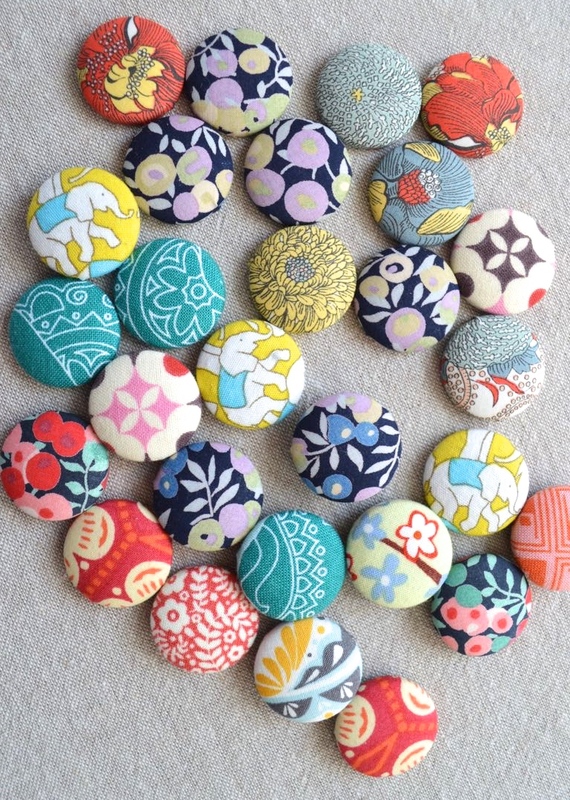 I use these as needle minders while I am hand sewing or EPPing…they are great!! These are amazing! I can’t wait to make some! I wonder if you could use those flat-backed marbles instead of a button kit, though? I might have to try that. I love clever ways to use scraps. Have you ever sprayed them with Scotch Guard or some sealer to protect the fabric? Hi do these take awhile to dry up.seems like the gorilla glue is not in a hurry to set.. Since this is DIY – I like to save these projects to do later – what am I NOT able to copy the photos and directions. I have a short memory.